This is a popular and cheap vegetable in Vietnamese cooking, specially in Northern. It maybe eaten raw or cooked like stir-frying, boiling, etc. It is only available at Asian market during summer time here and sometimes it is not cheap. It is sold in bundles about 1 to 3- lb each. We just need a bundle to make one or two side or main dishes. Remove and discard yellow or severe bruised leaves. Use your nails or finger tips to detect the tough fiber at the ends, snap off and discard the tough part. Wash them well a few times and drain. I like to wash them whole first for seeing or removing dirty stuffs easier. Do not need to dry them. If you want to stir fry, boil, or make a soup cut the vegetable into 3-in length, separate the trunks and the leaves with the tops because the trunks will need more time to cook. If you want to make pickled Rau Muong. Remove the tops and leaves, save them for others dishes. Cut the leafless trunks into 3-in length. 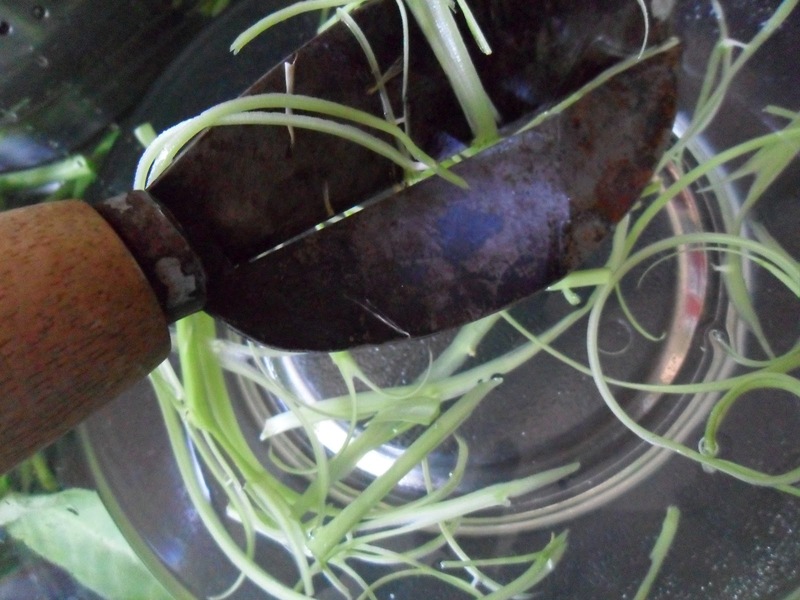 If you want to make a Rau Muong salad: remove the tops and leaves, save them for other dishes. Keep the leafless trunks long and use a vegetable peeler to slice the trunks into thin threads or just split them into half lengthwise and cover them with water. 1 lb Water Spinach(or leaves and tops from one 3-lb bunch) prepared like above. Marinate beef with 1/2 garlic, sugar, 2 tsp fish sauce, and ground black pepper. Set aside. Prepare water spinach. If you choose, you may blanch the water spinach trunks in a boiling a few minutes until the water spinach turn into a darker shade green, then put them into a cool water bath until cool. Drain them but no need to dry. 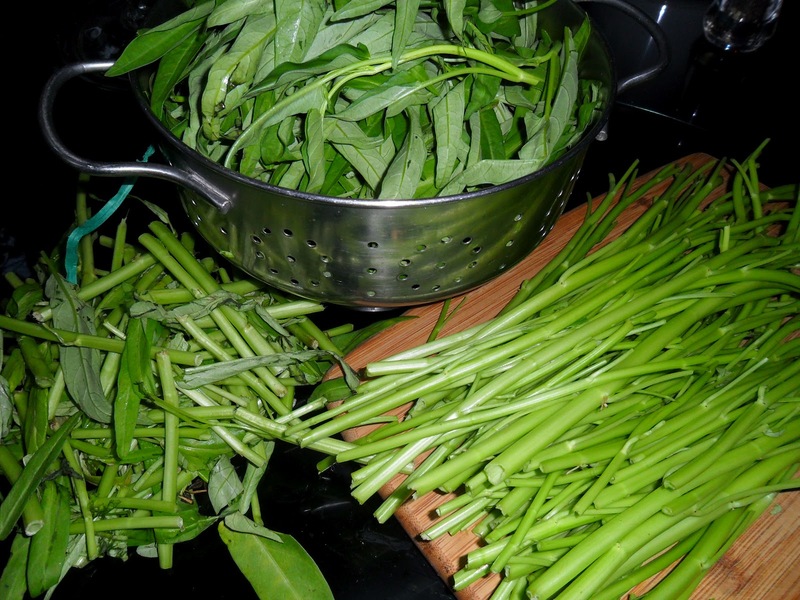 Blanching will help water spinach from shrinking and cooking faster during stir-frying process. Heat oil in a large saute pan over medium high heat, add garlic, stir a few second until fragrant. Add beef and stir until no pink color. Add water spinach (blanching or not) toss well, taste the liquid formed at the bottom of the pan. May add 1 tsp fish sauce for the taste. Add a few Tbs water to the pan if it is dried, stir until the water spinach cook as your liking. Transfer to a plate and serve as a side dish or main dish with cooked rice and dipping fish sauce. 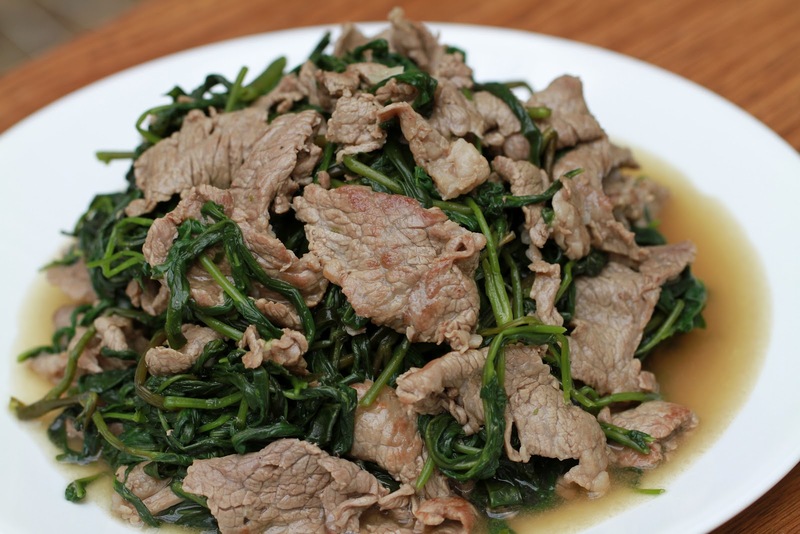 If you just want to serve stir-fried water spinach as a side dish, you may omit beef. Sometimes beef is stir-fried first, then being removed from the pan. Add oil and stir-frying water spinach in the same pan. When water spinach is soft and tender, add beef and toss well. If you want to boil water spinach, boil water (the water need to cover the vegetable) over the high heat, add the trunks first when water return to boiling again, turn the heat to medium, cook uncover about 5 minute. Add the tops and leaves cook a few more minutes to the softness of your liking. Drain, transfer to a platter. Save the water, add a little bit salt or fish sauce, taste and add lime juice or lemon juice. Serve the seasoning water like vegetable broth. Rau muống can be used in salad “Gỏi” as recipe here.